This week in Horror movie history, back on May 28th in 1982, Canadian Slasher film Visiting Hours arrived in US theaters. One of those films from the early ’80s, that seems like a very distant memory at this point, ask anyone who has seen it, they will tell you it is one of the more affective Horror films of the era. Visiting Hours still. © 20th Century Fox. 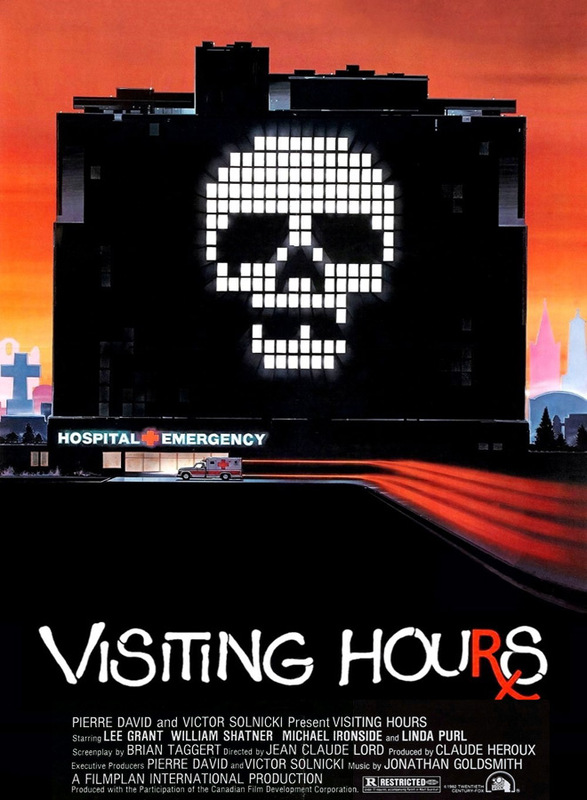 Released through 20th Century Fox in the US market, Visiting Hours was directed by Jean-Claude Lord (Bingo 1974, North Station 2002) and written by Brian Taggert (V series, Poltergeist III 1988), starring Michael Ironside (Total Recall 1990, Starship Troopers 1997) as deranged, misogynistic killer Colt Hawker who assaults Journalist Deborah Ballin (Lee Grant: In the Heat of the Night 1967, Damien: Omen II 1978). When he discovers that she somehow survived the attack, he follows her to the hospital not to bring her a teddy and flowers, but to finish what he started. A film that could fall under the genre of Thriller, it could also be looked at as a Slasher, and certainly one of the better entries to the subgenre of Horror during the decade. That said, it is not unlike many others in its time period, and as a result, been handed a bad reputation by many critics. However, this film is much more than what many negatively purport it to be. Instead, Visiting Hours takes the time to invest in suspense, develop a well-paced plot, as well as offers some pretty great performances from the main cast as well. An odd treasure of a Horror film, unlike most Slashers of the era, where there is mostly slicing and dicing with no backstory, this focuses on the warped, obsessive nature of the villain’s character rather than on the expected grim fates of the victims. While the killing sequences themselves are not the best quality, they are indeed effectively alarming yet uniquely intrusive on the viewer without being over-the-top in delivery. Aside from its moments of utterly slimy and gory bliss, some of Visiting Hours‘ true highlights come from the acting of its main cast. For example, Lee Grant gives a terrific performance as passionate feminist journalist, Deborah Ballin, who becomes the obsessive interest of the creepy killer. Then there is Linda Purl (The Last Days of Pompeii 1984, Fear of the Dark 2003) who also stands out in her performance of the wonderful and caring nurse Shelia Monroe, while Lenore Zann (X-Men series, Outlaw Star 2001) is wonderful as Lisa, the street savvy teen. 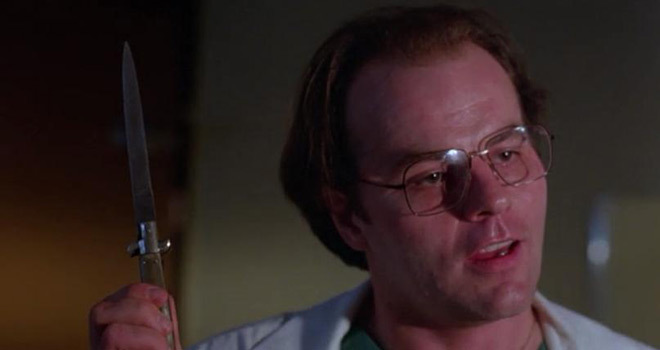 Best of all is Mr. Michael Ironside’s icy and unfeeling performance of the truly odd yet compelling murderer. Fitting for the role, he was cast based on his cryptic performance in David Cronenberg’s 1981 film Scanners, which was created by the same producers as Visiting Hours. It is his performance alone in Visiting Hours that truly stands out from the rest. In fact, his performance was so realistic that Ironside said that the limp he portrays almost effortlessly at the end of the movie was, indeed, very much real; he had broken his ankle on the first day of filming. Furthermore, in one of his only English language feature films, Lord does a fantastic job with creating a great atmosphere for these characters. Coupling this with a truly unsettling musical score by Jonathan Goldsmith, somehow even the more ordinary scenes within the hospital seem suspenseful, confined, and cramped, as if even the viewer were a part of the story. For many of the chase scenes, this voyeuristic technique make the production values for the film shine brightly. Looking deeper behind the scenes, Visiting Hours had the distinct honor of appearing on the UK’s “Video Nasty” list. Among a group of rare company including 1972’s The Last House on the Left, 1974’s The Texas Chainsaw Massacre, and 1981’s The House by the Cemetery, some may look at it as a badge of honor. It is saying, yes, you created a film that is so disturbing on several levels that it earned such a title, hence making it even more compelling to the curious mind of many viewers. What more could a Horror filmmaker ask for? Despite the negative response, Visiting Hours still remains one of the lesser-known but still beloved cult classics of the era. The question is why has it turned into a sort of hidden treasure? Perhaps a victim of circumstances, around six months prior to the release of Visiting Hours, another film in the same vein debuted and that film was 1981’s Halloween II. During this time, both films featured a skull on their movie posters. For Halloween II, the skull was superimposed over a pumpkin, while for Visiting Hours it was formed in a pattern with switched on lights over a dark hospital building. The latter’s title logo was printed in white lettering, with only the letter “R” in red to evoke blood, as well as a long serif crossed with a line to evoke both an injection syringe and intravenous drip. Obviously, the themes for both films were somewhat similar, and it did not help that the Visiting Hours’ musical score was heavily-influenced by the iconic musical score from the original 1978 Halloween film. All this said, while this Canadian Horror pearl is not very well-known to American audiences, Visiting Hours remains an authentic Slasher flick for its time. As it stands, it is an amazing choice for Slasher Horror fans young and old. Oh, and how could anyone forget, it also features Star Trek legend William Shatner. Bashed and written off by critics, do not believe everything you read! It is worth at least one watch if you call yourself a Horror enthusiast. So here is to extended visiting hours at the hospital with a loved one, just be careful not to overstay… you never know what the consequences may be!